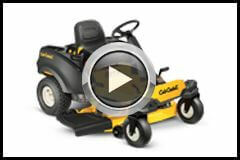 The Cub Cadet RZT S 46 zero turn is ideal for properties that has lots of hills. The reason being is the traditionally zero turn mowers with the two levers acted like shopping trollies on big hills, falling away at the front. 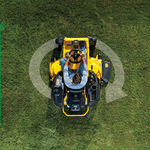 The steering wheel design removes this problem providing the operator with a zero turn mower that can easily go across hills not just up and down them. Featuring a 22hp Kohler 7000 series V-Twin engine you will have all the power you need to mower your lawn into pristine condition. The large 46" pressed deck will ensure that you get your property mowed quickly and efficiently so you can spend more time doing the thing you love, and the electric PTO allows you to engage the blades with the flick of a switch for you convenience. This advanced cutting deck with optimal airflow to help clear the grass from under the deck. The additional anti-scalping wheels will keep the deck off the ground and provide and efficient sharp cut to your lawn. The increased stability with the implication of the steering wheel allows this zero turn to mow steep hills with ease. the dual hydrostatic drive transmission give the operator full control over zero turn capabilities. Meaning you can go round obstacles as if they aren't there at all.